This is the third and final article in a three part series based on the results from a survey that ran on the site in December and January that looked to gauge the actual fan and owner interest in the implementation of Promotion & Relegation in the US and Canadian professional soccer pyramids. I have to admit that making the decision on whether or not to write these series of articles was not any easy one. The debate I’ve held with myself on covering the subject of promotion and relegation stretches back for the better part of a year. Deep down, I knew that doing so would bring me a windfall of grief. My words would be twisted, my intentions distorted and my mind numbed by the incessant drumming of some of the debate’s largest figureheads. All that happened well before I’d ever written a word on the topic in this space, so it was destined to be worse once I voluntarily jumped in with the sharks. But if I could imagine a world in a vacuum where one could talk about pro/rel in the US and Canada without igniting a firestorm and one’s name being dragged through the mud, it’s a fascinating topic to discuss. Set aside the incendiary nature of the debate as it currently stands. 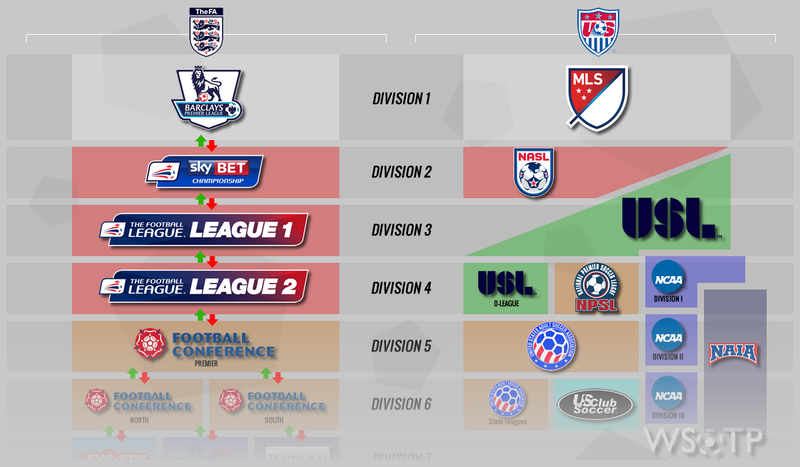 A comparison of the positives and the negatives of promotion and relegation’s implementation against the pros and cons of the current system requires so many different layers of thought. Logistics, finances, structure, migration path, legalities, desires — all of these are key elements in the conversation. And when one system appears to be beneficial for one of those factors, it could be a huge detriment to one of the others. I love reasonable, level-headed and cordial debates like these. And it’s for that reason that I considered writing about promotion and relegation long before I ever knew of anyone named Ted — I just never got around to it, other than stringing together the occasional set of 140 character opinions on Twitter. But it’s probably for the best that I didn’t. Because the reality is, it’s morphed into a ridiculously combustible topic here. It’s a conversation that features extremely passionate group(s) of supporters and opponents. Both sets seem to be growing, but so too are those that have grown annoyed with the discussion and its tone. The mere mention of the phrase “pro/rel” on Twitter can literally set off a never-ending stream of notifications on your cell phone for the rest of the night. It’s hard to not get caught up in it — particularly for someone like me whose passion for the game pretty much defines their existence. Unfortunately, in all of the mudslinging that goes down, there’s lots of hyperbole and opinion that’s tossed in alongside it like they’re undisputed facts. Everyone’s entitled to their own opinion. But if you’re going to broadcast yours and attack others unsolicited for theirs, you damn well better have more than a “belief” to back it up. To be honest, soccer is too important to me as a human being to allow potentially incredibly influential popular opinion to be established without it having some solid data to lean against. That’s the reason I ran these surveys in the first place: to establish the most comprehensive data set on the opinions and desires of two of North American soccer’s biggest constituents. I didn’t care where the numbers fell one way or another — I just want something to refer back to other than hunches and speculation. So with all that said, what is my opinion on the topic of promotion and relegation here in the US and Canada? What are my reasons for those thoughts? And did my thoughts change after seeing the results of the surveys? WHY DID I EVEN NEED TO WRITE THIS? After already reporting on the data collected from both supporters and club owners/front offices, you might be asking why it’s even necessary for me to write a third piece laying out my own opinions. It’s a relevant question. After all, I’m just one guy that runs a website and podcast. My own personal opinion doesn’t matter that much in the larger scheme of things. Unfortunately, having seen my own name repetitively dragged through the mud and back into the “discussion” on social media on more occasions than I care to think about, I write this third and final article in this series as a means of defending myself and my opinion. And with that in mind, it’s about time we bring up Ted Westervelt. For those of you who aren’t yet familiar with Ted — on the incredibly slim off chance you haven’t, read this in-depth bio from Howler to get the full picture — he’s the undisputed figurehead of the promotion and relegation movement within the United States. Best known by his twitter handle @soccerreform, Ted trawls around Twitter at seemingly all hours of the day, chiming in on any conversation he deems is relevant to his cause. I don’t follow the guy. Never have. Though I can recall him replying to me on things here and there as far back as 2010. In those early days, I’d interact back on occasion but none of those conversations stick out in my memory. But those who have crossed paths with Ted recently will be quick to tell you to not waste your time. Even if you baseline agree with him on some points, disagreeing with him on any level at all is grounds to be labeled opposition. And trust me when I say that being in Ted’s crosshairs will wear thin on you, quick. Look, I’m all for engaging discussion. There is literally no other topic I enjoy talking about more than soccer — hence the existence of this website and my chasing of the freelance soccer journalist dream in the first place. Yet in my personal experiences — and one I know is shared by many, many of my colleagues in US/Canadian soccer media — engaging with Ted and several other active proponents of promotion and relegation is hardly what I might consider a “discussion”, “conversation” or “discourse”. Whatever your argument, your approach or your thoughts might be, there’s only one right answer: their’s. Try bringing up a legitimate point that counters any of their lines of thinking? It’s dismissed. Ask them to admit there might be merits to the current system? Nope, there aren’t any at all. Request data or proof for a claim they’re making? Change the subject. Expecting an adult conversation? Nope, you can expect to be bullied into submission. And when you inevitably grow tired of arguing with a wall, Ted and his followers count it as a W in their personal pro/rel win-loss columns. To be fair, I’m generalizing a bit here. There are moderate proponents of the system out there, and plenty of reasonable ones that can engage in a rational, courteous discourse and debate. Having actually spoken with this type of person in real life, face-to-face interactions, I do know they exist. A rare beast though. But let’s get back to the whole “having my name dragged through the mud bit”, shall we? It started small. Unsolicited jabs from Ted calling me an “MLS Bot” and a “Eurosnob” — which, by the way, I can’t imagine two more diametrically opposed “insults”. He then moved on to making random proclamations about my supposed anti-pro/rel stance. I decided it wasn’t worth my trouble anymore when he stated claiming I was actively hurting US soccer by not agreeing with him 100% on the subject. It just seemed like I was shouting at the sun, so I blocked him to get out of his glare. But soon after, I started receiving occasional updates from followers along the lines of “Ted is talking about you again today”. I resisted for a while. I wanted to stay out of it. But since I’d last paid him any attention, Ted’s tactics had escalated from mindless beratings to far more dubious methods. So back in I was sucked. In the last four months, Ted has endeavored on a fairly in-depth smear campaign. He has incorrectly attributed quotes to me on multiple occasions in blasts to his followers. He intentionally distorts my own statements to use as arguments against me — a method he uses on others aside from just me, by the way. I once inadvertently gave him some free, positive exposure via an analytics service that I use. Ted used that not only as an opportunity to insult me, but also eventually turned it around to say that I was insulting him. The entire conversation is a bit mind blowing: watching him try to use three or four of the above tactics in a single thread before vanishing after I had worked him into a corner. But most despicably, he once attempted to imply that my supposed stance meant that I was racist. Seriously. Calling me names? I’m a big boy and can deal. Distort my intentions and beliefs. I might argue with you on that. Tell me that I’m hurting the game? Alright, I’ll just ignore you now. Tell potentially thousands of people I’m a racist? Yeah, I have a problem with that. I’m entitled to my opinion just as much as he is — but that’s no excuse baselessly attack my character. That is nothing short of bullying. I didn’t seek Ted out. I wasn’t engaging him in conversations. He literally went out of his way to attempt to discredit me and insult me. Line crossed, bro. As such, I want to make sure I take my opportunity to set the record straight. If someone untrue claim about me or what I’ve said, I want to have a documented answer I can point to that says clearly, “HERE IS WHAT I BELIEVE”. No mincing of words. Plus, I’m sure as hell not leaving my reputation as a journalist and human being to be defined by a person who is willing to resort to such despicable measures just to win an argument. So we’re seventeen hundred words in and I have yet to say what I actually believe with respect to promotion and relegation in the US and Canada. Get on with it, right? 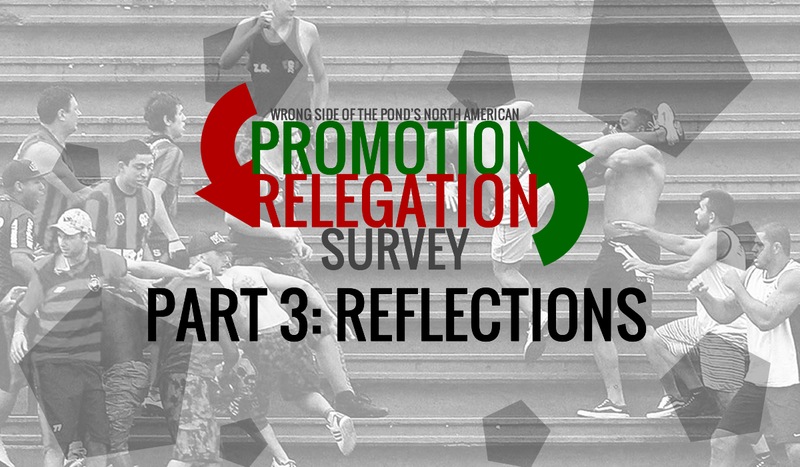 QUESTION: On a scale of 1-5, how strongly would you rate your desire to see the implementation of a promotion and relegation system between the levels in the North American soccer pyramid? QUESTION: Do you feel a system of promotion and relegation is a necessity for professional soccer to succeed in the US and Canada? QUESTION: Do you believe we will ever ACTUALLY see a system of promotion and relegation in the US and Canada? My rating of a “3” on the “desire to see promotion and relegation” question — the way I interpreted it — means that I’m open to either scenario working out. I’d be fine if we ended up with pro/rel, but I would also be okay if we ended up with something different. But if we had to boil it down to a simple “yes/no” question as Ted might prefer, I would give it a “Yes, I’m for the promotion and relegation system”. That answer might shock Ted, but it’s the truth. I absolutely love the relegation races and promotional playoffs that we see in English football each season; they’re often far more thrilling than the title race. I’ve supported Tottenham during spells where they have been involved in the former, and as nervy as it was, I still thoroughly enjoyed it. Too, I can see the merits of utilizing a promotion and relegation system. I do believe it’s the best system for rewarding (some) clubs that are getting it right on and off the field. I do think it provides motivation for ownership to succeed and not just bleed the club for money. And too, I do think it’s the most fair system because — in theory, at least — it allows every club the opportunity to chase their ambitions. Hell, I work as a TV broadcaster for a minor league club here in Cincinnati — it would be to my benefit if they were promoted! So if those are my beliefs, why then is Ted all over my back? In short: my answers to those other two questions. Much like the 68.2% of supporters and 86.7% of clubs who responded, I don’t think we need promotion and relegation in this country for professional soccer to be a success. And just to be clear, the “success” that I was asking about was success for any professional form of soccer in this country and not a specific league. Ted tried — and failed — to say that I asked that question with “success” equated to “MLS success”. I was’t implying that at all, Mr. McTwist. Why don’t I think it’s needed? Because if you ask me — and just about anyone else who’s tracked the professional game closely for well over the last 20 years — soccer’s doing pretty damn well here right now. Like the never been better here before kind of well. Everyone on the militant side of the promotion and relegation debate must have really short memories. I don’t know about them, but I certainly remember what it was like in pre-MLS days. Little coverage. Even less match broadcasts. I remember three clubs failing in Cincinnati before MLS was even a part of the picture. And for us to have come this far in in just twenty years — every Premier League game showing on TV every weekend, soccer bars that open up early so I can watch with others, growing interest in the game, expanding domestic leagues, humongous public crowds gathering to watch World Cup games — it’s mind blowing. Point is, we’ve gotten to this point by using the system we have now. Why would we go and blow up the entire system up just because most of us want something — which by the way, we don’t have any definitive proof that pro/rel would work here either — different? Think of it this way: I want all the money that’s in the bank down the street, but that doesn’t mean I can just walk in there and take it today. If I did, there would be ramifications for taking such drastic a course of action. I’m not saying promotion and relegation can never happen here. When we as a country and a system are ready for it, potentially then it can be an option. And much like if I want all that money from the bank, I have to think of a plan to earn that money — soccer here needs to earn the privilege of promotion and relegation before it can have it first. Why? Because like any other system, it has pitfalls along with it’s positives. And we need to first have a deeper, more ingrained connection with soccer in this country before that can happen. Just look at the places where promotion and relegation are currently being utilized. The most common shared attribute of those is the gigantic inequality gap between the “have’s” and the “have not’s”. And because most pro/rel systems involve greater financial rewards for finishing higher up the ladder, that gap grows ever wider by the season. So while every club in England might technically have the ability to rise to the top via the promotion and relegation system, the reality in doing so and then staying there becomes harder each year for each club further down the rungs of the ladder. That income inequality is a very, very, very destabilizing force in promotion and relegation systems. Look at the unsustainable levels of debt that La Liga clubs not named Real Madrid or Barcelona have run up trying to compete with those two big boys. Premier League clubs aren’t actually far behind, either — though their profits are admittedly higher. Don’t even bother looking at Brazil, while France isn’t much better. And in Italy, we’re watching a club die before our very eyes after trying to spend its way into contention. The only reason many of these clubs survive with such tremendous debts is because they’re social institutions in their communities. Often times they’ve been a part of the scene for 60/70/100-plus years. They’re either bailed out by a wealthier business person in the community with ties to the club, rescued by a grass roots movement by their fans, or they’re given a reprieve by the government. That, or the club is rescued by a false savior: short on necessary funds, a seedy background, or they make a deal with the devil by to become the plaything of an oligarch. Outside the last scenarios, I don’t personally believe — this is a statement of pure opinion and I have no evidence to back it up — that soccer in the US and Canada has the kind of social importance to lean against. Yet anyway. Maybe in 10 years. Maybe in 20. But I don’t believe we do now. The market just isn’t mature enough at this point. Now, while we saw that owners in the lower portions of the US pyramid are mostly for the system’s adoption — something that admittedly caught me a bit by surprise — what we don’t know is what those at the top of the current pyramid want. I have a feeling (opinion again) we can interpret their silence on the surveys to mean they have zero interest in ditching the model they currently have. And as much as Ted might argue they’re not needed, no meaningful promotion and relegation in this country is going to ever take shape without MLS clubs’ support. This primarily explains why I answered the last question — the one about “do I think we’ll ever see pro/rel here” — with a “no” as well. That hurdle just seems too big to clear. Does that mean that I think the current system is perfect? Hell no. I’ve written plenty on the lack of transparency in US soccer and MLS. Our “pyramid” is a mess with too many cooks in the kitchen. I’ve spoken at length about the need for more comprehensive youth development. I could go on for days on ways to improve things. But, that also doesn’t mean I’m ready to raze the town on a hunch, especially when things are already going so well. And that’s exactly what we would be doing if we shoved a promotion and relegation system down America and Canada’s throat right now. Look, I want soccer here to be successful here more than anything in the world. And I’ll be the first to admit that US soccer is missing some of the benefits that pro/rel would offer here. It all sounds great in theory — but so do lots of ideas. However, I’m a realist. I’d rather continue on a path of proven success, for right now anyway. And If things go to hell in a hand basket here in the next few years, then maybe this conversation might go a little different. Well… if Ted lets me get a word in, anyway.